Nakamichi AV1/AVP1 7.1 Decoder/Controller and Power Amp combination. 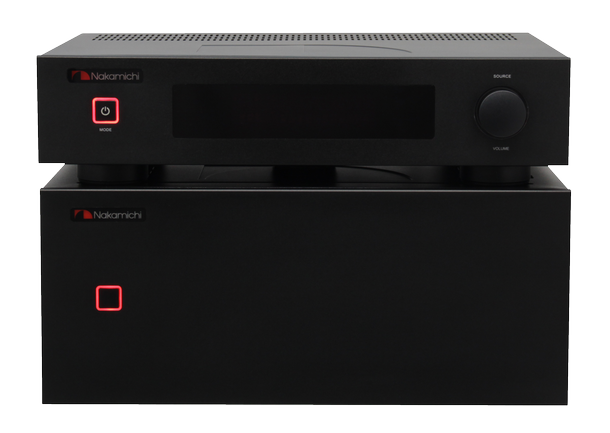 The AV1 processor and AVP1 power amp combination mark Nakamichi’s re-entrance into the AV Receiver field after a few years. The original AV1 won quite a few plaudits so how does this modern combo replacement fair. Well in summary it is a very fine attempt let down slightly by some lack of fine detail (mitigated to some extent when using XLR connections) and well worth an audition at the price. It’s a heavyweight. Well at least the AVP1 Power Amp is both in actual weight and power output. This thing is heavy weighing in around 32KG – definitely a 2 man carry. This actually caused us a problem with the review as our normal AV review area is up three flights of twisty stairs. We ended up unable to carry it up there. It is also a heavyweight in terms of power – at a claimed 150Watts on each of its 7 channels it really packs a punch. To be honest we never got it that loud – at 75% of maximum volume it was loud enough to shake the walls. 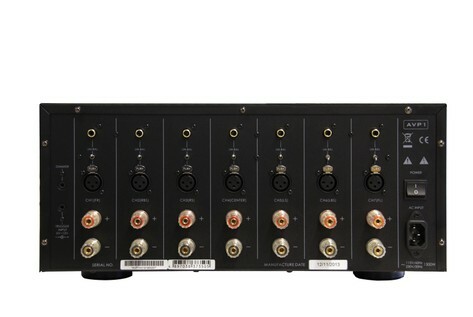 Connections between the AV1 and AVP1 are either by phono or balanced XLR. We highly recommend using the latter. Whilst they do add bulk, blind tests proved a real difference in perceived detail and clarity with all our listeners greatly preferring the balanced connections. Speaker Connections are by substantail binding posts which also take bananna plugs. We were disappointed when we first turned the combo on. The first content we played sounded harsh and muddied. It is surprising these days with the increasing use of digital stages that equipment still benefits from warming in but the Nakamichi definitely did. In fact it took a good week before a revelation occurred. Suddenly the harshness was gone replaced with a deep power and roundness. A good if not really expansive soundstage beckoned us into 7.1 sound and an easy almost casual ability to power through music entertained. This was particularly noticeable when using a set of relatively low cost bookshelf monitor speakers in stereo mode; on most amps we have tried these on bass seems to be a struggle, very unrounded and lacking in punch, but on the AV1 combo they sounded like much more expensive speakers with an easy to listen to bass. Yes there were still some issue. The casual laid-back approach (and I know that is not a scientific term but it was the way all our reviewers described it) seems to mask a lack of dynamism – a slowness to react. We wondered where this came from and as an experiment tried plugging the 7.1 output from another AV Processor into the AVP1 power amp – suddenly we had dynamism and tautness but still that easy power. Now the AV1 has firmware so maybe this is something Nakamichi can tweak. So we really like the AVP1 as a power amp it may be heavy but it delivers. We also tried it directly from the outputs a high quality 7.1 PC sound card and again this was fabulous and may be worth buying on its own. The AV1 processor comes with HDMI, digital and analogue Audio inputs but no Component or composite video which was an interesting choice. The HDMI is said to be 3D but not 4K compatible. It also supports HDMI’s audio return channel. This is also a good multi-zone controller with 3 independent zone outputs. The controller comes with Bluetooth that supports Apt-X and testing this with an Apple Mac Book Air we could not perceive a difference between connecting over Apt-X or by cable. Except that is when it broke up and we found we could not take the Mac very far from the receiver before it did this seemed to be Apt-X specific as the other Bluetooth protocols supported didn’t have the same range issue – although they didn’t sound as good. One major minus for the controller in the current market was the lack of any WiFi or Network support. This is very surprising seeing how well Nakamichi did this with their Air-Lilly range of speakers. I’m told network support is coming soon but have no details on what it will be or whether it will be available as an upgrade to existing owners. It does however have a very good DAB radio which picked up and decoded a number of stations our standalone DAB radio couldn’t using the same antenna. Control and setup was pretty simple with the on screen display and practical remote control. These are nothing special cosmetically but do the job and that is most important. There is a microphone supplied for auto setup of speaker size and distance. This took a while but gave accurate results. Some may prefer the richer user experience on some the Yamaha and Denon receivers but we felt in many ways the Nakamichi controls were simpler to pick up. We did however really like the cosmetic look of the devices. They have an imposing style and are obviously well built. We also liked the dimmable illuminated logo and display. It would be a little bright in most rooms if not dimmable. One other plus point for those interested in home automation or integrating with other equipment the controller has an RS232 port with a well-documented command structure. It also support HDMI-CEC. Price – we’ve seen it mentioned as low as £900 which would be a bargain and we would have no hesitation recommended the Power-amp on its own at that price. Controller is a little lacking in dynamics. XLR connections are really needed and add bulk. 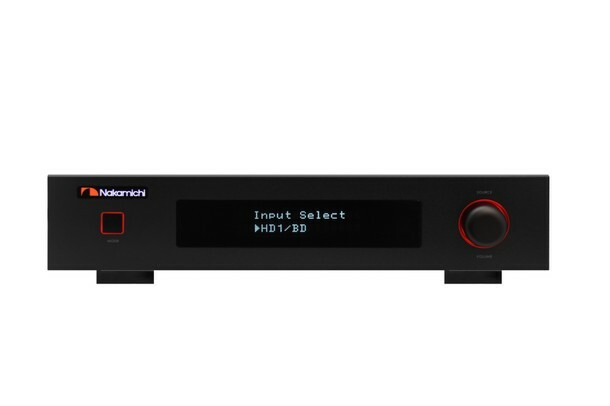 Price – the Nakamichi site is currently showing the price at over £2000 which is realistic but brings it in line with some more capable competition. In conclusion with a few tweaks to the controller Nakamichi could have a star on its hands here. We’re not sure if they can do much about the dynamics but the power amp could certainly cope with them. We would really want to see the network music capability added but if they were to do that as well as they did in the Dragon Lilly Speakers then they would be up there with the absolute best. Pricing is critical at the moment and I couldn’t bring myself to recommend the combination at the over £2000 price currently listed but at sub £1000 I would seriously give the combo a listen.